It is my mission to improve the health, well-being, and academic performance of our youth by training teachers to provide quality, skills-based health and physical education. After many years of teaching undergraduate and graduate health courses and health education in public schools, I have witnessed how health education improves the lives of our youth and prepares them to be productive members of our society. As a public school health education director and teacher, superivised programs, teachers, and engaged students in skills-based instruction. Seeing skills-based teaching in learning in action is seeing youth gain confidence and efficacy over thier own health. In collaboration with the Department of Elementary and Seconday Education, I designed and implement HEAP assessment training across the Commonwealth. Observing inservice teachers see the benefits of skills-based instruction and becoming excited about their teachiing and student learning was very satisfying. assessment in improving teaching and learning. 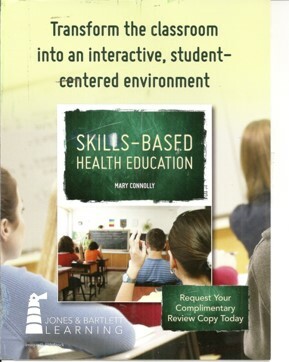 The publication of the second edition of Skills-Based Health Education by Jones and Bartlett aligns skills-based health education with social emotional learning. Readers enjoy the updated information on curriculum, instruction, and assessessments along withgrade span units. The new edition contains worksheets for each chapter that engage the candidate, the in-service learner, and the students in the classroom. I am also a very proud member of the Massachusetts Association of Health, Physical Education, Recreation, and Dance and serve as the Vice-President of Health Education. As vice president and in collaboration with the Board, we have organized and implemented the National Health Education Conference, held in Salem, Massachusetts. Presenters from across the country are scheduled to present in August, 2018. Check out the details on the MAHPERD website: http://www.ma-hperd.org/﻿. Join us! With is local, state, and natioanl experience, I am pleased to offer my expertise to your district to improve your health, physical education, or wellness program. Mary Connolly, BS, MEd, CHES- Author, Program Chair of the Skills-Based Health/Social Emotional Learning Department at Cambridge College, professor, and health education consultant. Mary Connolly is an accomplished health education professional whose career spans nearly four decades and includes teaching and administration in public schools and higher education. In Mary's consulting business, she provides custom professional development for health and physical education teachers. Mary lives in Weymouth, MA, with her husband and enjoys a life rich in travelling, ballroom dancing, cycling, cooking, and gardening. She delights in spending time with her two children, their spouses, five grandsons, other family, and numerous friends. Copyright 2018 Mary Connolly, Health Education Consultant. All rights reserved.